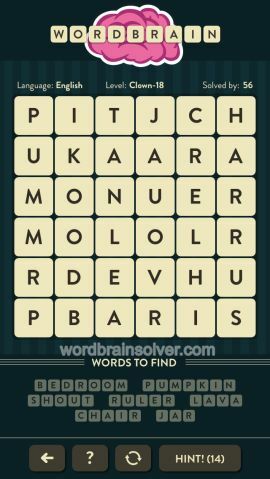 Wordbrain Clown Level 18 Answers and Solutions. Have all the words. My puzzle doesn’t look.like this one. Start with bedroom, then pumpkin, and cannot complete. .Help! Unable to complete. Have all the words but my puzzle is not laid out like yours. Help! Have all the he words but can’t say solve it.